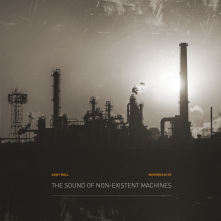 Saint Null is a Bulgarian sound artist on the noise/ambient divide, conjuring up textures between meditative bliss and metropolitan noise pollution. In his debut release on Mahorka "The Sound of Non-existent Machines" the space is vast, and mostly cold. There is motion and activity at many levels, at all times, things vibrate at different rates, at times everything decays into (not so) white noise. Whatever the machines are, they occasionally operate in harmony. It's also likely that for a brief time the operators of the machines reveal themselves.